Have taken lots of photos for your family, friends, or special events such as birthday, graduation, wedding, anniversary, etc.? Creating a photo slideshow is a fun-filled way to back up the memories in your life. 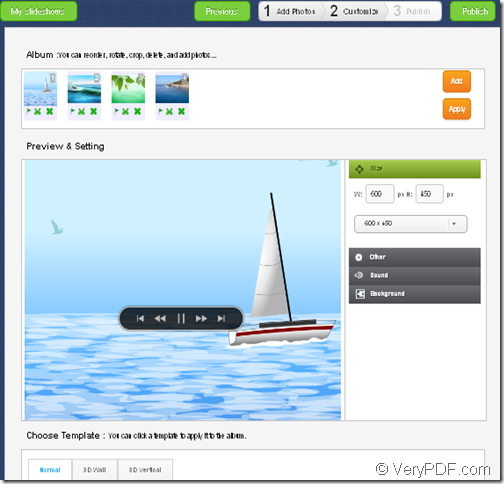 This article will provide you a totally free way to make slideshow with VeryPDF Slideshow. VeryPDF Slideshow is a wonderful online app that you will come to love when you see how incredibly easy it is to add photos, create stunning photo slideshows with music/3D effects, and share them with your friends and family. Just in 3 steps, you can successfully make slideshow from local photos. Please click Next button to switch to the “setting” page as shown like the next snapshot. In the “Album”part of this page, you can reorder, rotate, crop, delete, and add images and photos. In “Size”option, you can choose a fixed size in the drop-down list or customize the size yourself for the created slideshow. 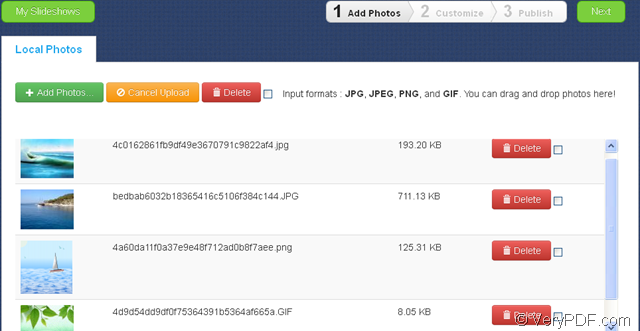 In “Other”option, you can decide to change the background of the generated slideshow into transparency. In “Background” option, you can choose a default background or upload a background you like. In “Choose Template” option, you can click a template to apply it to the album. It provides normal, 3D wall and 3D vertical templates. 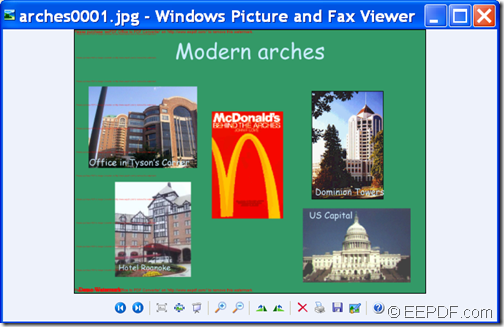 You can see these three templates from the following snapshots. In “Preview & Setting”, you can preview the effects. Please click Publish button to publish the created slideshow. Once the slideshow is published, it will generate a unique URL for each slideshow. You can copy and paste the generated link into Twitter, Google+, Facebook, etc. to share it with your friends. Note: VeryPDF Slideshow is now under testing and it will be officially released soon. During the using, if you have any questions, you can contact support group of VeryPDF. If you want to convert PDF to black and white/grayscale image, the application EEPDF PDF to Image Converter Command Line will be a good choice for you. PDF (Portable Document Format) is widely used in documents archiving, distributing and exchanging. 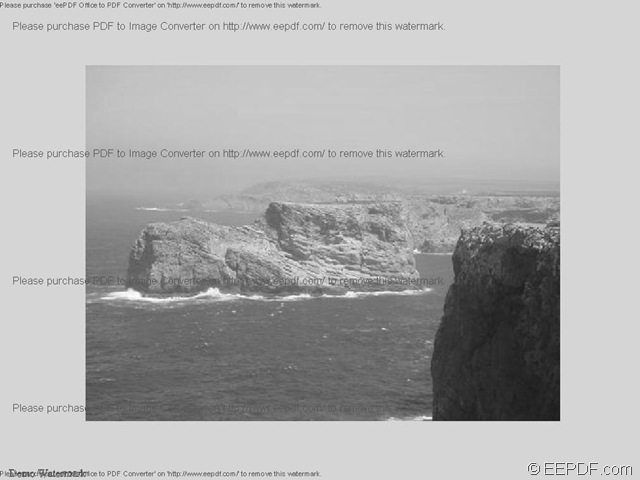 But, sometimes, you may need to convert PDF to black and white/grayscale image. Black and white image or monochrome image can look artistic, sophisticated and modern. Grayscale image is composed exclusively of shades of gray from black to white. EEPDF PDF to Image Converter Command Line is a professional command line application that can convert PDF to image (JPG, BMP, PNG, GIF, TIF, TGA, PCX, PNM, RAS, PBM, etc.). What’s more, it supports to convert PDF to black and white image and convert PDF to grayscale image. In the following contents, you will see how to use this application to accomplish the conversion from PDF to grayscale image and the conversion from PDF to black and white image. Please free download EEPDF PDF to Image Converter Command Line at first. After the download, please unzip the downloaded file to a folder in your computer disk. In the unzipped package, you are able to see an executable file named pdf2img.exe which is the called program in the MS-DOS command prompt window. Please open the MS-DOS command prompt window in which you are able to input commands at first. Then, please refer to the following command line template to input your commands into the opened MS-DOS command prompt window. <PDF-file>: specify the source PDF file. <img-file >: specify the target image. In order to convert the PDF document to monochrome/ grayscale image, you can use the following options: -mono which is used to generate a monochrome image and –gray which is used to generate a grayscale image. This example is to convert a PDF document named prince.pdf to a grayscale image named prince.jpg. At last, please hit Enter on your keyboard to run the commands. Seconds later, you can get the target images in the specified location. This is the end of this article and you can enjoy full version of EEPDF PDF to Image Converter Command Line here. The command line application EEPDF PDF to Image Converter Command Line allows you to convert PDF to image of specific size. PDF (Portable Document Format) is able to transfer data electronically while preserving the original texts, images, formats, layouts, etc., thus it’s widely used in documents archiving, distributing and sharing. But, it can’t be directly opened by many common applications. In order to make PDF documents more accessible to others, converting PDF documents to image will be a good choice. 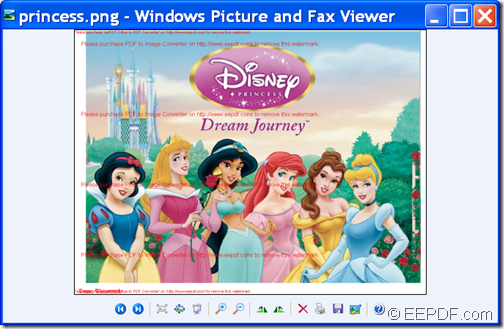 EEPDF PDF to Image Converter Command Line is a powerful command line application that can convert PDF format to JPG, PNG, BMP, GIF, TIF, EMF, TGA, PCX, PBM, PNM, RAS, etc. What’s more, it allows you to customize image size. With some simple steps, you can successfully convert a PDF document to image of specific size. First, please free download the package of EEPDF PDF to Image Converter Command Line. Then, please extract the package to a folder in computer disk. In the extracted package, you can find an executable file named pdf2img.exe which is the called program in the MS-DOS command prompt window. At first, you need to open the MS-DOS command prompt window so that you can input commands. In the opened MS-DOS command prompt window, please follow the command line template below to input your commands. <PDF-file>: specify the path of the input PDF file. <img-file >: specify the path of the output image. In order to set image size, you can use the following options: -w <int> which is used to set image width and -h <int>which is used to set image height. 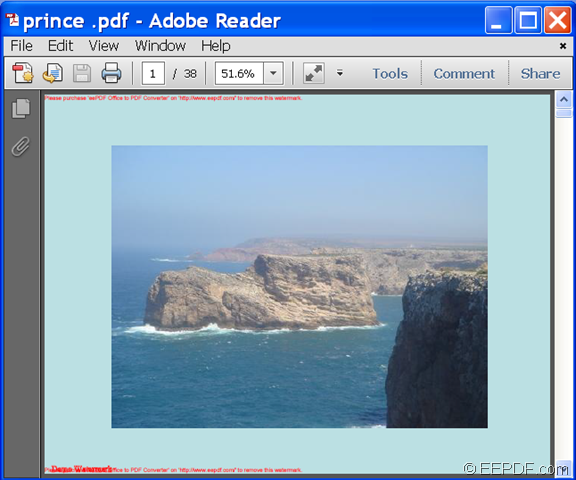 This example is to convert a PDF file named balet.pdf to us.png image. After inputting the commands, please press Enter on your keyboard to run the commands. Seconds later, you can get the target image in the specified location. Please check the conversion effect from the following snapshots. This application can do more than setting image size. To know more usages and options, please read the readme.txt document in the unzipped package. With the help of EEPDF PDF to Image Converter Command Line, you can convert PDF to image (JPG/ PNG/TIFF/GIF) and set image resolution. In the following contents, you will see how to use this application to convert PDF documents to images and set resolution for the created image. Please free download EEPDF PDF to Image Converter Command Line and unzip the downloaded file to a folder in your computer disk. In the unzipped folder, there is an executable file named pdf2img.exe which is the called program in the MS-DOS command prompt window. First, please open the MS-DOS command prompt window in which you are able to input commands. Then, please input your commands into the MS-DOS command prompt window by referring to the following command line template. 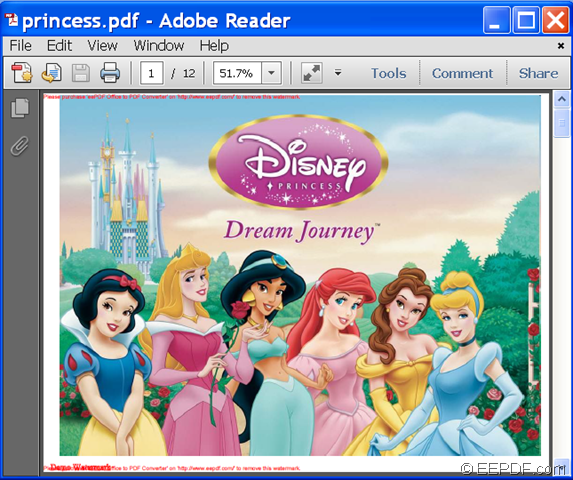 This example is to convert a PDF file named alice.pdf to alice.jpg image and set the X and Y resolution as 300 respectively. After inputting the commands, please press the Enter button on the keyboard to run the commands. Several seconds later, you can find your target image in the specified location. You can check the conversion effect from the following snapshot. Do you want to just convert specific pages of PDF to image (JPG/ PNG/TIFF/GIF)? If so, the application EEPDF PDF to Image Converter Command Line will be a good assistant for you. PDF (Portable Document Format) is currently the most widely used electronic document format worldwide. However, it is difficult to view some PDF files on small screens that come with some readers and smartphones. 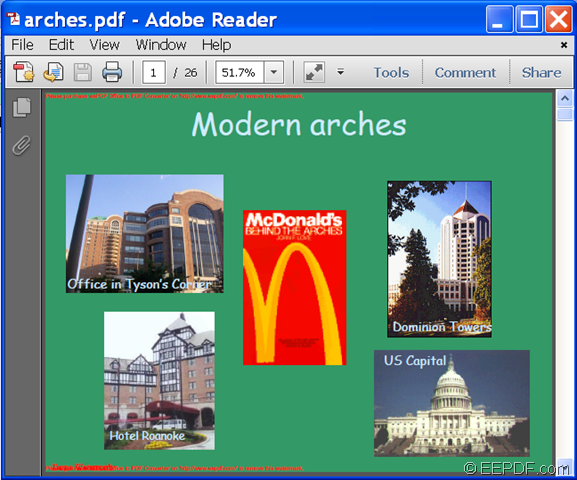 To resolve this problem, you can convert PDF documents to images. EEPDF PDF to Image Converter Command Line is a powerful command line application that can convert PDF to various image formats including BMP, GIF, JPG, PNG, TIFF, JPEG, EMF, TGA, PCX, PNM, RAS, PBM, TIF, etc. It can not only convert a whole PDF document to image, but also can convert specific PDF pages to image. Just by following the steps below, you can successfully convert a specific PDF page to image. 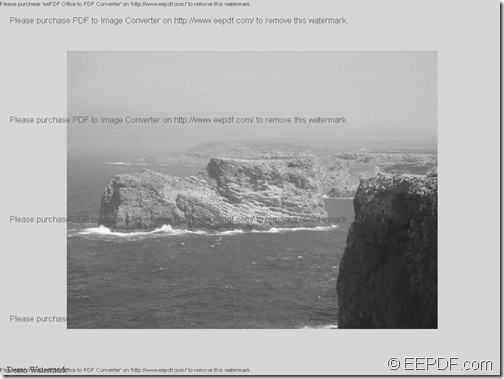 Please download the package of EEPDF PDF to Image Converter Command Line. Then, please unzip the package to a folder in computer disk. 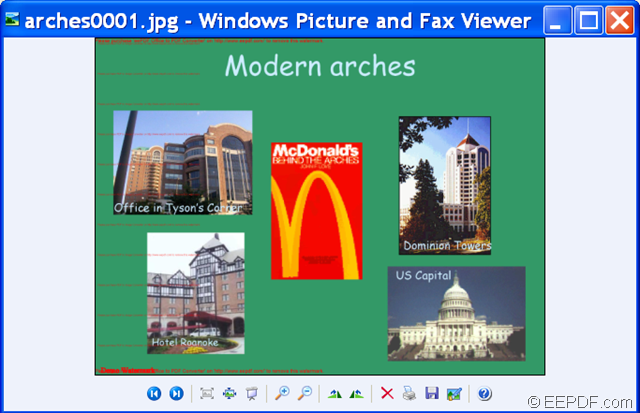 In the unzipped folder, you can see an executable file named pdf2img.exe which is the called program. In order to input commands, please open MS-DOS command prompt window in which you can input commands first. Then, please refer to the following command line template to input your commands. <img-file >: specify the output image. To convert a specific PDF page to image, you can use the following two options: -f <int> and -l <int>. This example is to convert a PDF file princess.pdf to princess.png image. In the following two snapshots, you can see the original PDF file and the converted PNG image. In fact, this application supports more options than the above ones, and you may learn more usages and options from the readme.txt document in the unzipped package. This is the end of this article and you can get full version of EEPDF PDF to Image Converter Command Line.